I don’t know how long ive been thinking of coming to Leh. Perhaps for a couple of years now. But it is quite far from my home town Pune and also from London where i’ve lived for the last 7 years and it always seemed inaccessible at the time. Also, it’s proximity to Kargil reminded me of the Indo-Pak war of 1999 which made me nervous even thinking about a solo trip up north. But once i decided to leave my job in London to go backpacking then Ladakh automatically got added to the bucket list, all my fears invalidated just like that. Infact the only certainly i had when i set off on my trip was visiting Ladakh and this was the only part of my trip that i was willing to plan around. Ladakh district (now called as the Leh district) is the north east portion of the topmost state in India, Jammu & Kashmir, and Leh is the biggest city of this region. Ladakh literally translates into “Land of high passes”. As with most of my travels, the name of a place resonates with me (for some unknown reason), then i do some minor research about it, look at some pics and decide to go for it. All i knew of Leh was that it is situated at an elevation of 3.5kms and is surrounded by beautiful lakes and rugged desert mountains. As for it’s inhabitants, I hadn’t expected much as a few people who had been there told me how commercial and overpriced the city is and how the locals are money minded and not very friendly. The first couple of days after i flew in, i religiously heeded the advice about AMS (Acute Mountain Sickness). No exertion except perhaps a walk in the town is recommended for the first 24-48hrs. My first impression of Leh was nothing spectacular. All you see is barren mountains around the town with the same coloured houses mostly built of mud bricks. I love colours so Leh felt too dry to look at. But the more time i spent here the more the city grew on me. I started to love the barrenness, the old rustic charm, the countless prayer wheels and prayer flags dotted around the town, the tibetan refugee markets selling gorgeous pashminas, rugs, carpets, jewellery, handicraft etc. 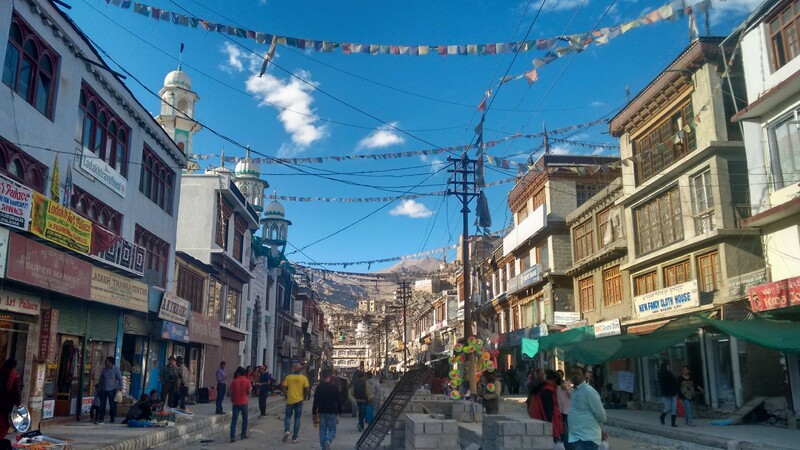 Leh main bazaar with innumerable prayer flags surrounding the mosques. And the Ladakhi people are just so warm, it is what makes Leh feel like home to me. One is greeted with smiles and “Julley” which is a local greeting, locals (mostly the older ones) sit by the roads rotating miniature prayer wheels in their hands, the shopowners ask you if you’d like to buy something from them and if you say no they never push you but just smile as you keep walking. i love how (local) men don’t leer at women here. In fact some seem almost shy and won’t even make eye contact for long. Others will look at you but its more a look of curiosity, a look that doesnt make you cringe or question your choice of clothes. I really enjoy walking around the town, simply smiling and calling out Julley to people, and exploring it’s countless markets and cafes. Buddhism seems like the dominant relighion here but there are almost equal number of Muslims too and they seem to live in harmony. I love that there is a big mosque bang in the center of the main bazaar from where you can hear the azaan and if you walk a little away into one of the alleys you hear the buddhist chant of “Om mani padme hum” being played on speakers. I haven’t been impressed with the food here though. The chinese food almost always lacks the flavour that you would find in restaurants elsewhere in india. The noodle soup of Thukpa varies vastly in taste and quality from cafe to cafe. Only the indian food and momos can be consistenly relied upon. My fav places to eat so far are Chaska Maska near the main bazaar for indian and south indian, Hot Pot on Old Leh road, Wonderland cafe and World Garden Cafe on Changspa road. 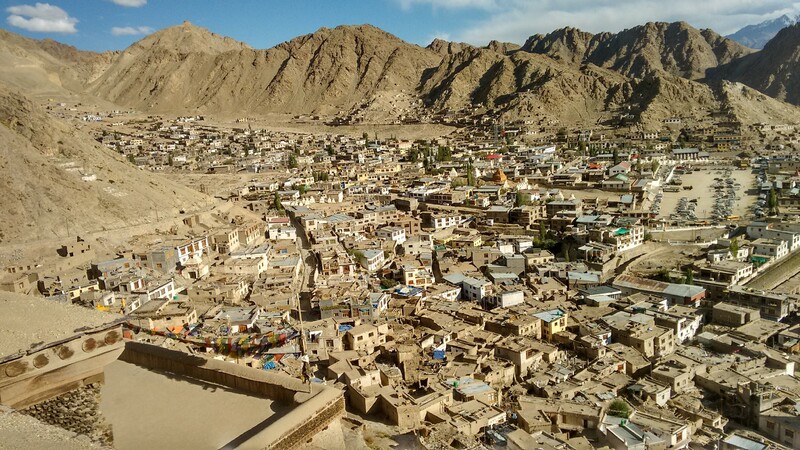 Once i realized i would be in Leh for a while i decided to look for a homestay. I wanted to experience the local culture from close up and frankly i’d reached a point where dorms/cheap guesthouses weren’t appealing to me much. Instead of asking travel agents i starting asking locals in cafes and minimarkets for a good home that would be willing to accommodate me and i was lucky to find a loving homestay with extremely caring people. It is the best place i’ve stayed at in my 6months of backpacking. From day 1 I was made to feel like i was part of their family and it is the perfect base for my exploration of Ladakh. Ladakhis have to face really tough living conditions in the winter. In summer, the direct sunlight is harsh, electricity is intermittent and there is no constant running water. The goverment provides water a few times a week which is stored in tanks and then connected to pipes which provide running water. Hot water is received through geysers or goverment subsidized solar heaters. This is the easy part of the year. The temperature in winter drops to a minimum of -20 and the roads going out of Leh are blocked due to snow that is several feet high. The electricity is even more intermittent as snow plays havoc with the power lines. And of course, there is no running water and if you need to drink some, you first need to break chunks of ice and then melt it. To keep warm the families gather in one room, usually the kitchen, which has a mechanical coal heater. Most of the Ladakhis spend their summer months working in their farms harvesting fruit and vegetables, some of which they sell but the rest is basically cleaned/washed/dried to be used in the winter months from December to April. As the region is cut off from the neighboring areas the locals store enough grains, pulses and dehydrated vegetables to last these harsh 5 months. It is perhaps the shortage of basic things that make people value them even more and every effort is made to minimize waste. For eg, water which was used to wash rice or rinse fruit is stored and then later used to water the plants. Stale bread and rotis are fed to the dogs. Organic waste like pits from fruit or vegetable peels are fed to the cows. It is the harsh living conditions and inconveniences that affects everyone alike and is probably the reason that evokes a deep sense of unity and bond among the locals. 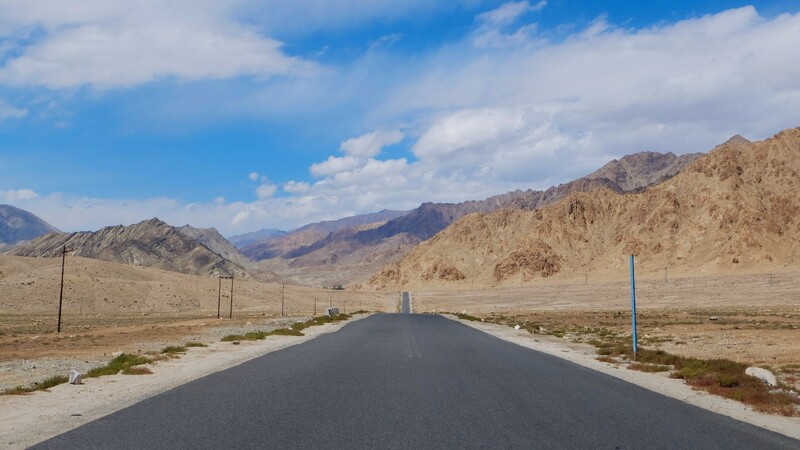 In terms of attractions, most are quite a long drive away from Leh but there’s still enough in and around the town to keep you busy for a good few days. 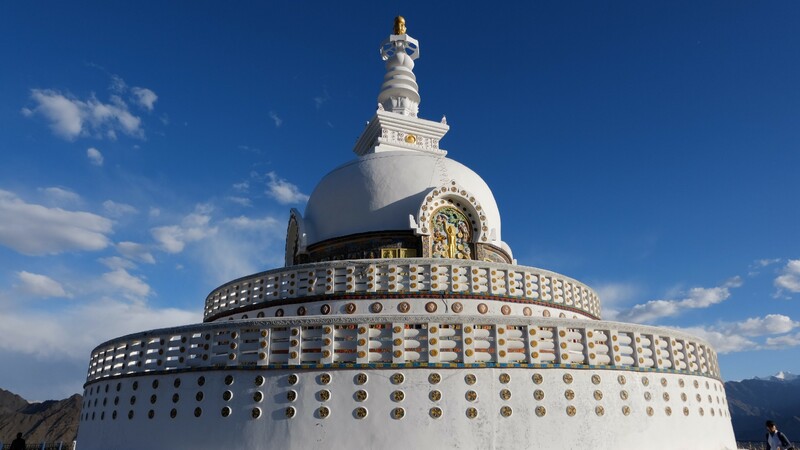 In the town there is Shanti Stupa and the Leh Palace both of which offer different views of Leh and can be covered in a couple of hours each. 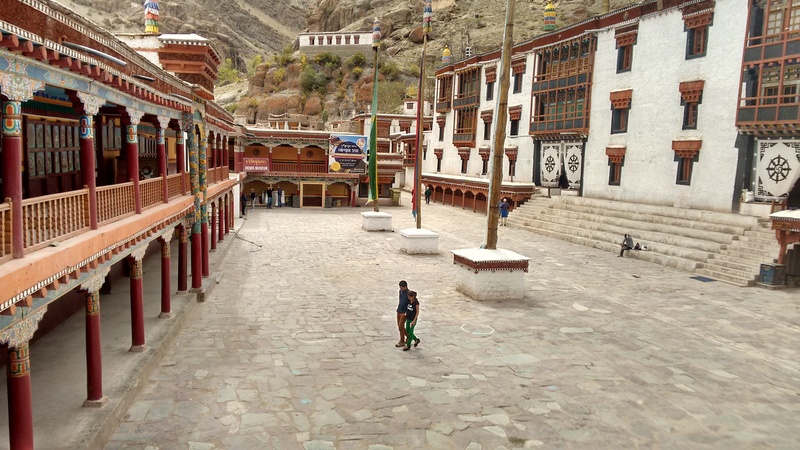 To the southeast, there are Shey, Thiksey and Hemis monasteries (also called gompas). Shey monastery, which is also known as the Shey Palace, is ok-ish to look at from the outside and in ruins from the inside. 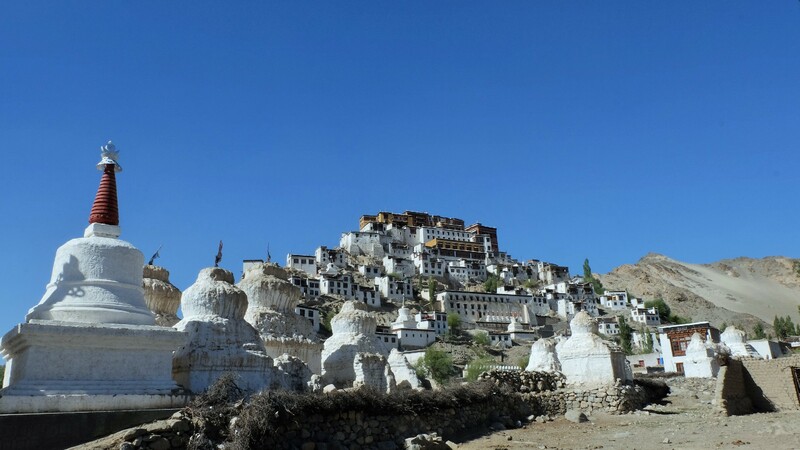 Thiksey monastery, which is the largest monastery in Central Ladakh, is quite impressive inside and out. Hemis monastery was probably the richest of the monasteries in Ladakh with impressive Buddha statues and lots of murals and wall paintings in the temples. Visiting this gompa during the Hemis Festival would certainly be an event to remember! 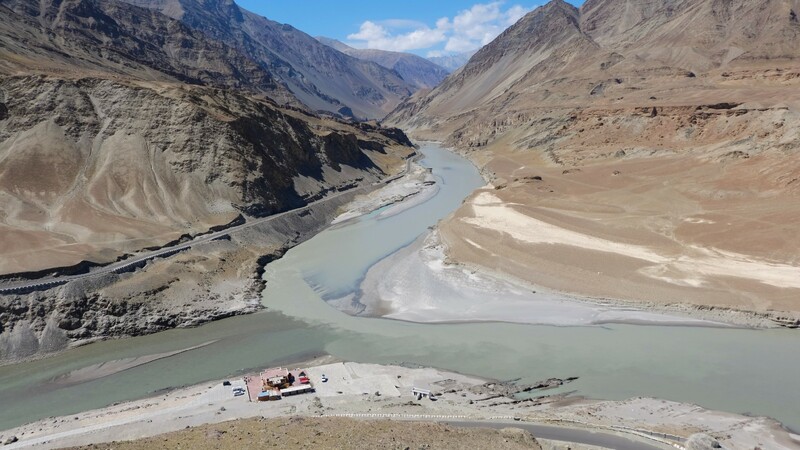 To the southwest of Leh there is Spituk monastery and Hall of Fame museum, further west is Gurudwara Pathar Sahib, Magnetic Hill, Confluence of rivers Indus and Zanskar, and monasteries of Likir and Alchi. I skipped the Spituk gompa and I didn’t feel any of the “vehicle pulling itself uphill” effect at the Magnetic Hill but the rest of the sights are definitely worth a visit in my opinion. To the north of Leh is the Khardungla pass which, at a height of 18380ft, is one of the highest motorable passes in the world. I don’t know what I was expecting but being at the pass was actually underwhelming. The surrounding mountains and geography of the area is such that you can’t really see or appreciate how high up you are and the view from the pass left a lot to be desired. But as it was just a stop on the way to Nubra I didn’t feel that I had wasted my time. 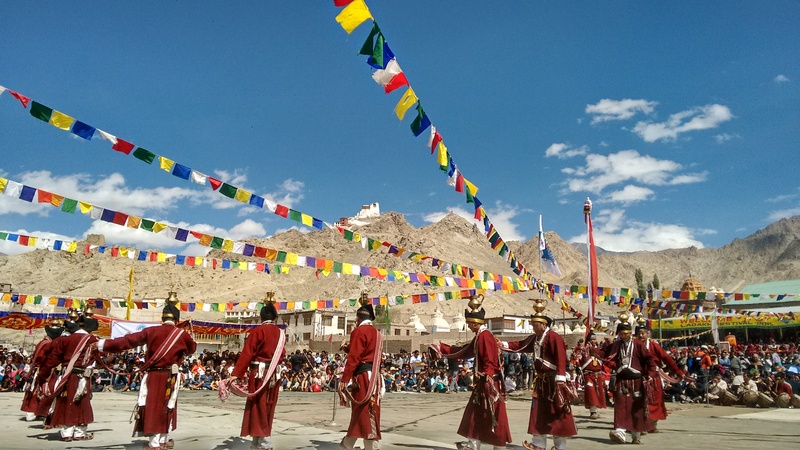 I happened to be in town for the week long annual Leh festival. The inauguration parade started an hour early (which is a first!) but it was lovely to see the locals out in their finest traditional garb but it was a small-ish group and the parade passed by in less than 5mins. The polo ground, where most of the functions were held was interesting too. Lot of traditional dances performed by locals dressed in colourful costumes belonging to different cultures (from Ladakhis, Nubra, Tibetan, etc). It was an afternoon well spent. 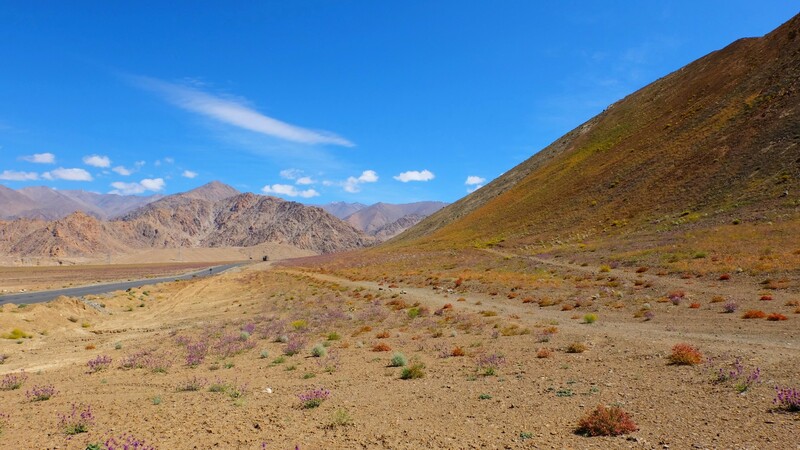 Chilling, to the southwest of Leh, in the Hemis National Park, is an amazing destination for a bike ride. It’s not too far from Leh and the scenery, as usual, was brilliant. I’ve been for countless bike rides in the last 6 months but this one was my favourite! Not only was it in Ladakh but I rode a Royal Enfield 500cc from Leh to Chilling. It was only my second time on this bike but I just fell in love with it! So much so that for the next few weeks all I could think of was buying a bike of my own! One of the best things to do in Ladakh is to venture out on a bike (or a car if you can’t ride). The view on most of such journeys is beautiful. You’ll pass barren unforgiving mountains which will change to mountains of different hues set against stunning blue skies which will change to different coloured plants growing on an otherwise barren mountain. Traveling around Leh is a perfect example of when the journey is more beautiful than the destination itself.